The role of land and natural resources in conflict is attracting increased international attention due to the changing nature of armed conflict and as a result of a variety of longer-term, global trends. This Guidance Note provides policy and programmatic guidance to UN and EU officials confronted with land related grievances and conflicts. 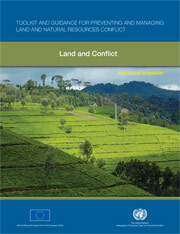 Land and natural resource issues are almost never the sole cause of conflict. Land conflicts commonly become violent when linked to wider processes of political exclusion, social discrimination, economic marginalization, and a perception that peaceful action is no longer a viable strategy for change. Land issues readily lend themselves to conflict. Land is an important economic asset and source of livelihoods; it is also closely linked to community identity, history and culture. Communities, therefore, can readily mobilise around land issues, making land a central object of conflict. Addressing land grievances and conflicts is fundamental to creating sustainable peace. International assistance should prioritise the early and sustained engagement in land issues as part of a broader conflict prevention strategy. Such early attention can reduce the human, economic, social, environmental costs of conflict.